Array Architects has recently renewed its commitment to giving back to the community. Sparked by a challenge from CEO Carl Davis, the New York, Pennsylvania, Texas and Washington, DC offices have dedicated hundreds of hours in 2016 to multiple organizations in their respective regions. The Philadelphia office of Array was introduced to CityTeam as 20 staff and family members convened to serve dinner to those in need at Hope Café – where the goal is to serve their “guests as if they were dining at a five-star restaurant.” City Team is a non-profit organization assisting with the needs of people struggling with poverty, homelessness and addiction. As the group of designers witnessed the incredible mission being carried out by City Team, they couldn’t help but notice the physical environment did not instill the sense of hope one might wish for. Array got to work building a team and creating a work plan to improve the space for City Team and those they serve. Array met with the leaders at City Team, spoke with the residents in the rehabilitation program, and solicited feedback from many of the guests who receive help from City Team to create an environment that met the needs of the organization. Through the positive relationships of the designers and the many material suppliers they work with every day, the vast majority of the construction materials were donated to the cause. Array has partnered with Skanska USA Building and Target Construction to bring the new design to life. The contractors have not only donated the time of their skilled craftsmen and managers, but have also provided additional materials to complete the project. When complete, City Team will not only have a new beautiful home for its Hope Café, but will also have a new front entry for volunteers and residents, space for the volunteers, a new entry and vestibule for the guests, and a refresh to its food pantry. As the next few months are the busiest time of year for City Team, phasing of the project is necessary. 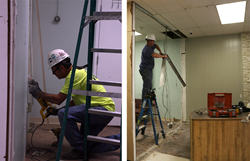 The improvements began Monday, October 24th at the front entrance and will continue through January. City Team will remain open throughout the project, with minimal impact on guest flow and available services.